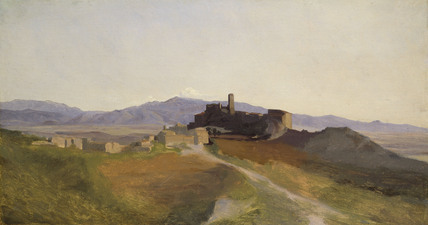 Although this view of Olevano is of the same type as the sketches which Corot made in Italy in the mid 1820s, the thin, rubbed style of painting is uncharacteristic and the former attribution to Corot is not tenable. The sketch was probably made by one of Corot's French contemporaries working in Italy in the early 19th century. Olevano, a hill town east of Rome, was a popular site for foreign artists.